Dull pain in your neck and shoulders, feels good over the weekend but made worse by being at work or driving long hours? You may have Monday morning syndrome. We can’t fix that. However, disc irritations in your neck we can. Irritations of the cervical discs (in your neck) sound frightening but in reality are a very common injury amongst desk workers, drivers and manual workers. It can cause pain in the neck, shoulders and in some cases down the arm. 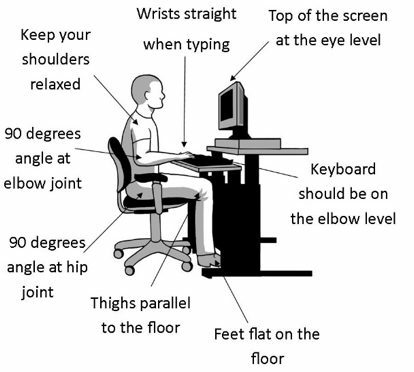 The primary cause for this is posture. You’re all slouches, but it’s okay, we are too. The difference is we know how to minimise and prevent it. Let us share the knowledge. If left that dull ache can become something nastier than that bar tab you forgot you started, don’t leave it that long. Deep Neck flexor exercise: or the ‘Chin tuck’, is an exercise that helps maintain good head position. Standing against a wall, retract your head backs, toward the wall, trying to flatten your neck against the wall and pull your chin in. 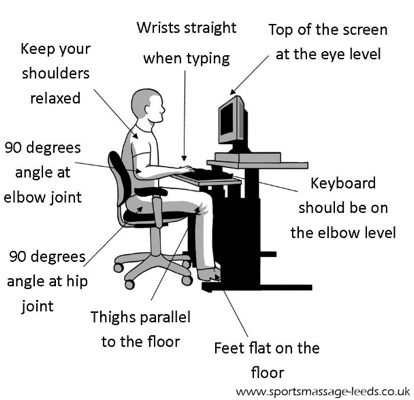 Good sitting posture can prevent and reduce postural pain, ensure your workspace is set up as the diagram shows. To learn more about neck pain, please contact Hinterland Physio on ph. 4972 5155, or request an appointment today!